The PVI ramp is an excellent choice when a more permanent ramp is desired. No assembly required. Its one-piece design makes it ideal for wheelchairs and scooters with three or four wheels. 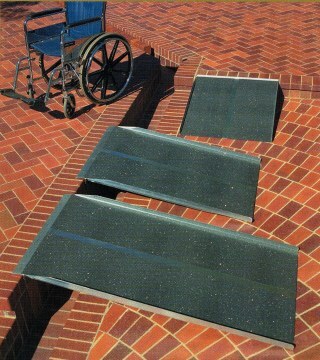 PVI ramps are constructed of aluminum and have a slip resistant surface. Please remember that the State of NH has adopted and follows the ADA National Building Code for liability reasons. A ramps incline ratio must be no greater than one foot in length to one inch in height. This is an important safety standard, that benefits clients, delivery people, health workers, and family members alike. Considering New England snows, this rule should never be compromised. All ramps over 29 inches off the ground must be constructed in such a way that the railing will have openings no bigger than 4 inches. While most towns will make exceptions for temporary hospice, we recommend getting a note from a doctor. The ADA standards for turning and resting platforms are a must.